Case comment: M/S Allied Blenders and Distillers Pvt. Ltd. v. Govind Yadav & Anr. 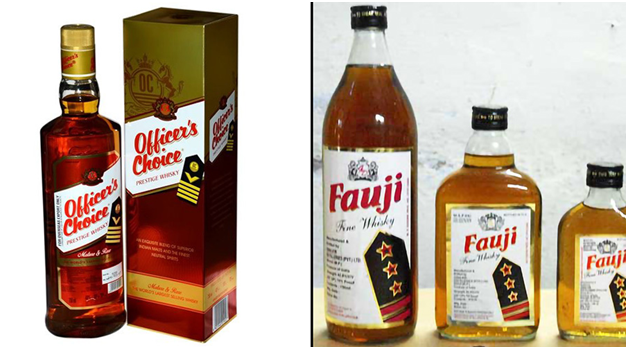 The Hon’ble Delhi High Court has recently held that there is no deceptive similarity between the marks “Officer’s Choice” and “Fauji” and has rejected Allied Blenders and Distillers Pvt Ltd’s trademark infringement suit for its mark ‘Officer’s Choice’ against the owner of another alcoholic beverage, ‘Fauji’. An Image depicting the marks is reproduced here for the sake of convenience. The Plaintiff in this case argued that the plaintiff’s trademark “Officer’s Choice” and the defendants‟ trademark “Fauji” are conceptually and deceptively similar as the idea behind plaintif’s trademark and the defendant’s trademark is similar. “Fauji” is a commonly used Hindi language phrase which means a “Military Officer”. Furthermore that the plaintiff and defendants are in the same trade/business and are using their respective mark with respect to goods of identical description i.e. whisky; the likelihood of the confusion amongst the consumer is very high. The Plaintiff’s counsel also contended that the plaintiff’s and defendant’s labels are conceptually and deceptively similar as it can be clearly seen that “Fauji” is written in red color slanting upward in a stylized font and has a similar color combination as that of the plaintiff’s product. I feel that the argument was correct, however the cases which were produced in support of the same were the ones where in the infringing mark was a direct hindi translation of the original mark or a synonym of the original mark eg. “Peacock” and “Mayur” , “Surya” and “Bhaskar” ,”Sun” and “Suraj” . This actually weakened their case , since in the present case Fauji (military man) cannot be said to be a plain Hindi translation of the word “Officer” as Officer does not necessarily means a Military officer . In light of the above, I personally feel that the Counsel should have focused more on proving deceptive resemblance and not that infringing mark is a translation of the original mark. How to determine Deceptive Resemblance? “For deceptive resemblance two important questions are: (1) who are the persons whom the resemblance must be likely to deceive or confuse, and (2) what rules of comparison are to be adopted in judging whether such resemblance exists. As to confusion, it is perhaps an appropriate description of the state of mind of a customer who, on seeing a mark thinks that it differs from the mark on goods which he has previously bought, but is doubtful whether that impression is not due to imperfect recollection”. Now in the instant case of M/S Allied Blenders and Distillers Pvt. Ltd. v. Govind Yadav &Anr, it can be clearly seen that the plaintiff is manufacturer of whiskey under the brand name “Officer’s Choice”, the price of the said whiskey ranges from INR 200 to INR 500 for 750ml bottle. Similarly the defendant who is also manufacturer of whiskey under the brand name Fauji is selling its whiskey at a price of INR 200 for its750 ml bottle. It is however to be noted that INR 500 is for the Officer’s Choice reserve collection and a price as low as INR 200 is for the basic collection. This fact clearly proves that the consumer base for both Officer’s Choice and Fauji is the same and basically comprises of poor people; people who cannot afford drinking expensive whiskey. This group of consumer is not assumed to be literate enough and more or less relies upon their memory with respect to appearance of the product, rather than its name. It is in same analogy as Patients asking for “Red Pill” for Viagra and Purple Pill for “Astrazenca’s Nexium” which has been given protection of the colour Purple and Indian drug Giant Dr Reddy was directed to change the colour of its drug which was a generic version of Nexium. Since the overall packaging of both the whiskey is similar the mark is used in Red Italics in similar fonts and white background, it is most likely to deceive the consumer base and create confusion. In addition to this Fauji bottle also epaulette (on which stars are placed according to rank) which is a part of “Ofiicer’s Choice” packaging is also present on “Fauji” Bottle with minor modifications. The contentions presented before the court were majorly of translation as a result of which the Hon’ble court in the instant case just failed to consider the visual aspect. Whereas Hon’ble Delhi High Court itself in its previous judgement has relied heavily on trade dress and overall appearance of the product, in order to determine trademark infringement. In its 2008 judgement delivered by, Reva Khetrapal, J , the court allowed the plaintiff’s application wherein it claimed that the defendant has infringed plaintiffs’ trade mark IMPERIAL BLUE by adopting the trade mark IMPERIAL GOLD and has used the trade dress, get up, colour combination and label of ROYAL STAG, thus committing acts of infringement of trade mark and passing off. Making reliance on the precedents given by Delhi High Court itself it can be easily concluded that in cases of trademark infringement, trade dress plays a very important role. In the instant case of M/S Allied Blenders and Distillers Pvt. Ltd. v. Govind Yadav & Anr., it is my humble opinion that had the Plaintiff’s counsel pressed more upon the overall packaging of the two whiskeys i.e. Officer’s Choice and Fauji it would have given them a better mileage while arguing the case. Author: Mr. Shubham Borkar, Senior Associate – Litigation and Business Development and Anjali Jain– Intern, at Khurana & Khurana, Advocates and IP Attorneys. In case of any queries please contact/write back to us at shubham@khuranaandkhurana.com or at www.linkedin.com/in/shubhamborkar. Kerly , Trade Marks, 8th Edition, p. 400.
 an ornamental shoulder piece on an item of clothing, especially on the coat or jacket of a military uniform. PernodRicard S.A. France and Ors. Vs. Rhizome Distilleries Pvt. Ltd. and Ors.,2009 (39) PTC 367.
Colgate Palmolive Co v Anchor Health and Beauty Care Pvt Ltd 2003 (27) PTC 478 (Del).